Dr. Monica Miller, author of Abandoned: The Untold Story of the Abortion Wars (Saint Benedict Press; 2012), has seen firsthand that showing abortion-minded women photos of abortion victims awakens souls and saves lives. She recalls the day that she had two saves. Dr. Miller was counseling a woman at the Michigan Avenue Medical Center in Chicago— showing her photos of aborted babies—when another woman scheduled for an abortion came up behind her. “She peeked over my shoulder, and I heard a voice say, ‘Oh my G**, I cannot do that to my baby!’” The woman fled the abortion clinic, and so did the woman that Dr. Miller was counseling. “I have been present at the awakening of souls. There is a distinctive look that comes across the face of someone, who upon seeing abortion victim photos (AVPs) for the first time, realizes the hideous truth about abortion,” Dr. Miller says. Considering a growing trend in the pro-life movement to shun AVPs, Celebrate Life Magazine talked with Dr. Miller about why it’s crucial for pro-lifers to refrain from calling pictures of aborted infants “graphic images” and instead call them “abortion victim photos,” why it’s crucial for the pro-life movement to use AVPs, where AVPs are best used, and more. You coined the term “abortion victim photos.” Why is it crucial that we use this kind of wording instead of “graphic images” when referring to pictures of aborted babies? The term “graphic images” is grossly insufficient; the picture of a preborn baby killed by abortion is not simply a “graphic image.” Such language doesn’t indicate the subject of the photo, and it’s the subject of the photo—namely a victim of injustice— that’s important. The graphic nature of the image is secondary. Indeed, many photos of babies killed by abortion are not graphic, though they will be disturbing or unsettling. We must call these images “abortion victim photos,” as such terminology is exact, truthful, and immediately draws the needed attention to the injustice and tragedy of abortion. Not only is AVPs a truthful reference, but it also declares the truth about abortion itself—that abortion is unjust and there are victims. Which kind of AVPs are most effective and why? There are too many AVPs in which the abortion victim is drowned in blood matter and unrecognizable as human. The most effective AVPs are those in which the humanity of the preborn child is immediately recognizable— the figure of the preborn child is not obscured or overwhelmed by the blood and guts. Why do you think the pro-life movement has shied away from using AVPs? Not everyone in the movement has “shied away” from the use of AVPs, but there is a strong wing of the movement that opposes their use. I think those who oppose AVPs have a misguided preoccupation with the public image of the pro-life movement and falsely believe that the display of the images makes the movement look extremist, confrontational, and insensitive. It is impossible for the movement to succeed without exposing the actual injustice! The entire goal of the abortion industry and its political, social allies is to treat the preborn as if they do not exist. Also, there’s a concern that the images make women who have had abortions feel bad. The legitimate need to be sensitive to the feelings of post-abortive women cannot restrict the need to expose the horror and injustice of abortion. The preborn are the group directly oppressed by legalized abortion. Where should AVPs be used? During sidewalk counseling and in literature given to women entering clinics. 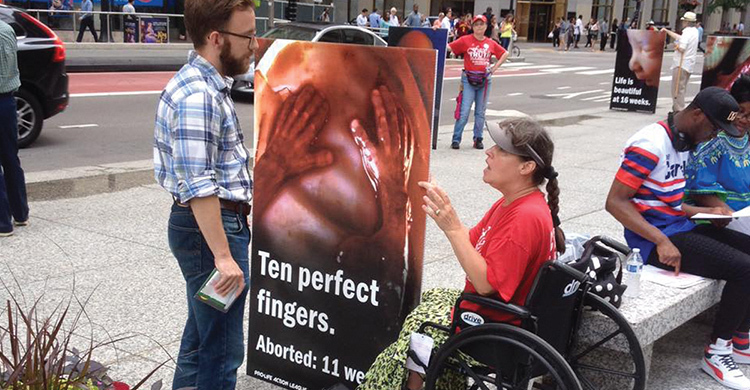 However, this isn’t a good setting for large posters because sidewalk counseling isn’t a protest of abortion. In this setting, posters of AVPs may hinder the one-on-one needed conversation outside of clinics. If there’s no real opportunity for those intimate one-on-one conversations, then AVP posters should be used in tandem with signs that give phone numbers of pregnancy help centers and other encouraging words. They also should be utilized in public thoroughfares (e.g., Face the Truth Tours), by Pregnancy Help Center counselors, on college campuses, and outside of high schools, and in educational seminars. Where should AVPs never be used? The images shouldn’t deliberately be posted outside of grammar schools, day care centers, playgrounds— environments specifically designed for the congregating of children. Yes, in public displays children may happen to see them. Under normal circumstances, we would not want children to see these pictures, but the fact is that we are not in a normal circumstance. Legalized abortion has cast us into an emergency in which consciences must be aroused and the preborn respected and saved. By not showing the reality of abortion through AVPs, aren’t pro-lifers helping Planned Parenthood keep the secret? It’s an absolute fact the one thing that the abortion industry hates the most is the abortion victim images. I have been in debates with abortion advocates. As soon as I pull out the photos, the abortionists are thrown off balance; whatever arguments they have look silly, superficial, and vapid. They fear the pictures because they know just how compelling they are. The most valuable aspect of the Center for Medical Progress videos is not what the abortion providers say about abortion, rather it’s the video of the freshly-killed preborn babies in the back room where technicians are rummaging through the body parts of the babies. It is a glimpse of hell, and the abortion industry will never be able to run from such images! Visit bit.ly/DMM-AVPs to read Dr. Miller’s full treatise on use of AVPs.